These Rhythm Puzzles have been published in the Netherlands Heart Journal and are reproduced here under the prevailing creative commons license with permission from the publisher, Bohn Stafleu Van Loghum. A boy with a birth weight of 3.030 g was born by caesarean section at 33 weeks of gestation because of bradycardia and severe foetal hydrops. Physical examination at birth showed a hydropic neonate with a heart rate of 70 beats/min. He had cutaneous syndactyly between the fourth and fifth fingers of the left hand. During the first week of life he suffered from polymorphic ventricular arrhythmias for which β- blocker treatment was started and an epicardial pacemaker (VVI) was implanted. An ECG a few weeks later is shown in the figure. The 12-lead ECG shows sinus rhythm with a frequency of 98 beats/min. The PQ interval is 140 msec and the QRS width 60 msec (normal value for a neonate). The vertical axis is normal for the age. Repolarisation is grossly abnormal and clearly alternates in morphology every other beat. 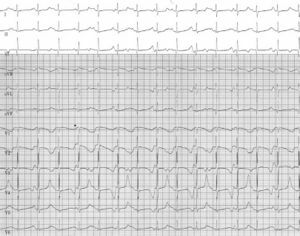 This T-wave alternans is visible in every lead but most clearly in lead V4. The QTc interval is severely prolonged and varies between 665 and 689 msec. The P wave fuses with the terminal part of the T wave and intermittently was not conducted (i.e. functional 2:1 block, not shown). The combination severe QT-interval prolongation and syndactyly is classical for type 8 LQTS also referred to as Timothy syndrome. It presents frequently at birth with life-threatening polymorphic arrhythmias in the setting of severe QTc prolongation. Besides syndactyly (present in virtually all cases) extra cardiac features include congenital defects (ASD, VSD), hypoglycaemia, and autism. In 20% a hypertrophic cardiomyopathy is shown, as was also seen in our case on echocardiography. 2 Left ventricular systolic function was decreased (left ventricular shortening fraction 20%). DNA analysis in our case also revealed the de novo CaV1.2 missense mutation G406R. After one month, he developed recurrent torsades de pointes and syncope. Mexiletine 15 mg/kg and oral potassium supplementation were added to the therapy and an extracardiac single-chamber implantable cardioverter- defibrillator (ICD) was inserted at 4 months of age. He received numerous ICD shocks and eventually died at the age of two years after cervical sympathectomy. This page was last edited on 19 October 2008, at 05:47.